Inhibition of autoantibody production by anti-CD137 mAb’s. NZB/W F1 mice were injected intraperitoneally with anti-CD137 or control mAb’s, and serum samples were collected and assayed in triplicate by ELISA for anti-dsDNA antibodies. IgG or IgM anti-dsDNA autoantibody titers are expressed as the mean ± SD measuring the OD, at 495 nm, of triplicates for individual mice, using serially diluted serum samples. (a) Anti-dsDNA IgG serum titers of 41-week-old NZB/W F1 mice that were injected at weeks 14, 17, 20, 23, and 26 with anti-CD137 (open squares) or isotype-matched control mAb (filled circles), compared with serum from BALB/c mice (filled triangles). (b) Kinetics of IgM production in anti-CD137 mAb–treated mice (filled circles), mice treated with isotype-matched control mAb’s (open squares), and PBS-treated mice (filled triangles). (c) Kinetics of the appearance of IgG dsDNA-reactive autoantibodies in NZB/W F1 mice that received a single 200-μg intraperitoneal injection of anti-CD137 (filled squares) or control mAb (open squares) at 8 weeks of age. (d) Kinetics of IgG anti-dsDNA autoantibody production in mice in which anti-CD137 treatment (filled triangles) or isotype control mAb (open circles) 8-week-old were treated through 25 weeks of age (200 μg injected intraperitoneally every third week). (e) Kinetics of anti-dsDNA autoantibody production anti-CD137 treated (filled triangles) or control (open circles) mAb treated at 26 weeks of age after they had developed autoantibodies in their serum. 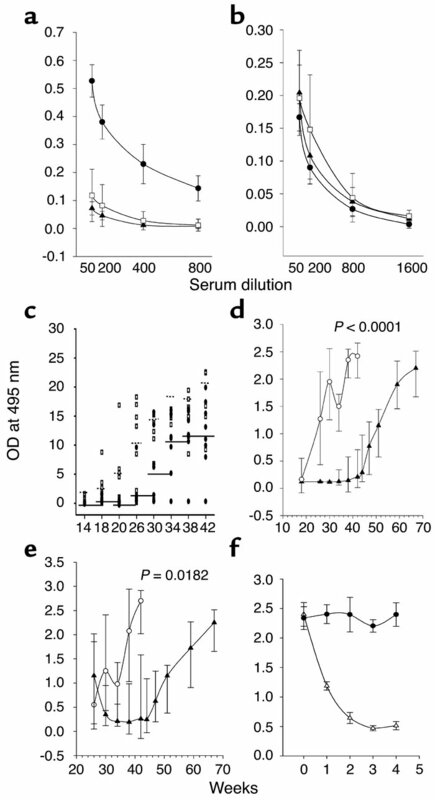 (f) Clearance of serum anti-dsDNA IgG autoantibodies in proteinuric 40-week-old NZB/W F1 mice treated with a single injection of anti-CD137 (open triangles) or control mAb’s (filled circles).